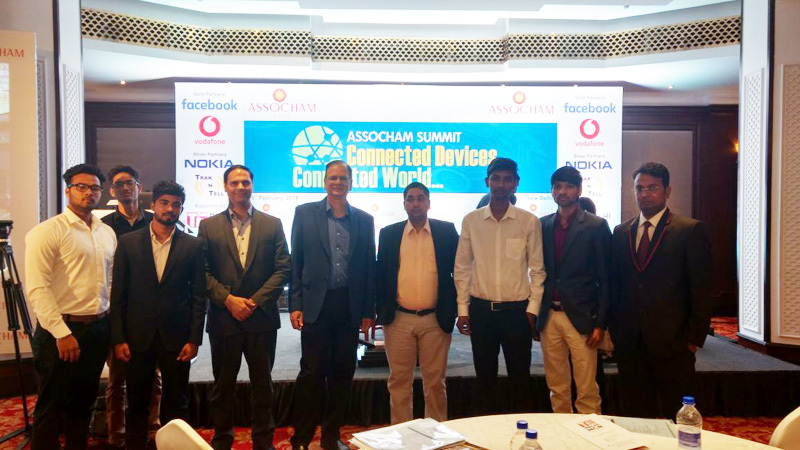 The Associated Chambers of Commerce and Industry of India (ASSOCHAM India) organized a summit on “Connected Devices… Connected World”. The event was held at The Claridges, New Delhi on February 16, 2018. Faculty and students of ECE and Mechanical Engineering Department attended this summit. The event was focused on three major application domains of Internet of Things (IoT) – Connected Mobility, Healthcare & Connected Medical Devices and Wearables, and Smart Homes & Smart Cities. Keynote Talks and Panel Discussions were held on these three domains which witnessed participation from various corporate groups, leading startups and academia from across the country. The event was inaugurated by Ms. Aruna Sunadararajan, IAS, Telecom Commission & Secretary (T) Department of Telecommunication, Government of India along with Chairman, President and Secretary General of ASSOCHAM. Mr. Amit Marwah, CMO - Nokia India, in his inaugural talk highlighted the latest trends and opportunities in IoT and need for the network infrastructure to provide required connectivity and data handling capacity for IoT applications. During panel discussions, various applications of IoT in field of Automotive, Healthcare and Smart City were discussed and views were shared by eminent speakers – Mr. Sunil David, Regional Director – IoT, AT&T, Mr. Angira Agrawal, Senior Vice President & Enterprise Head, Vodafone, Mr. Alok Shankar, Country General Manager, India, Fitbit Inc., Mr. Neeraj Singh, Director, KPMG, Mr. C V Kamesh, Senior General Manager, Hitachi, Mr. Subrata Kumar Mitra, Director , Huawei – to name a few. It was mentioned by all the speakers that IoT is the next driving force for industry, and technology development in all spheres is required in India cope-up with the global scenario. Shri Sanjay Goel, Joint Secretary, Ministry of Electronics and IT, Government of India shared upcoming policies, regulations and efforts being done by the Government to support IoT application and companies working in this field. It was a highly knowledgeable experience for the students and faculty to interact with such eminent personalities and to know the future direction of industry and technology.